Art has always fascinated me; how different textures, mediums and objects can come together to create an image, statement, convey feelings or tell a story. I enjoy incorporating natural and recycled objects in an unusual context, adding different layers and depth to a piece which creates a beautiful finished product; all which will last generations! I love to work with clients who want a personal consignment piece including their own meaningful trinkets, keepsakes, photos etc. which adds to the sentimental value. My inspirations can spring from a found object, a beautiful sunset, a candid moment with my kids, a trinket my child pulled up from the bottom of his or her toy box, the lids of my teapot or even a sequence of feeling or events that happened that day. We are surrounded by a splendor of artistic magnificence and magic. We all need to open our eyes which are the windows to our souls, and discover even the smallest wonders. You will see this form of art has truly unlimited possibilities. Take a chance, be creative, and express yourself. I create art to share the way I see things, with humor, sensitivity and a touch of magic.
. This award-winning artwork reflects and highlights the beauty in the world around us, and has been featured throughout Vancouver Island, the Lower Mainland, Canada; and the United States of America. Stain glass, vitreous glass, glass gems and squiggles, custom made glass beads and pendants, commissioned glass unicorn horn made with Diochroic glass, mirror, shattered safety glass, jewels/old jewelry, crystal, amethyst, cast metal, steel line, steel cable, embroidery thread, confetti glitter paint, glow in dark, ephemeras, collage, text. The inspiration for Unicorn Dream was developed from the final scene from a childrenâ��s story I am writing called Mariahâ��s Magic Quest. Woven throughout the book are images of my fantasy themed art mosaics; fairies, mermaids, castles, dragons, and the unicorn, along with beautiful illustrations created by my talented sister. Included in this particular piece of art are messages from the story which emanates powerful energy and magic. An important silver medallion is located on the art which is a significant piece in the end of the story. Another unique feature with this mosaic is it can be viewed after the lights are turned off. The entire night sky and moon glow in the dark, excluding the black silhouette of the girl and unicorn. Absolutely magical! I am very excited about the inclusion of my art pieces into this insightful childrenâ��s story, and how Unicorn Dream contains words and visual clues from the story, unifying them together. We are looking forward to the completed book project! 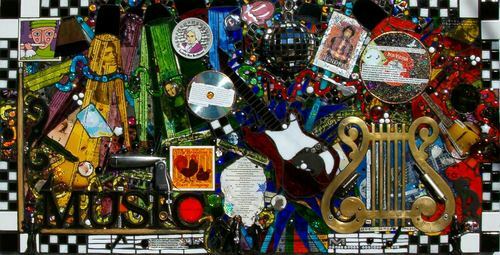 Stain glass, vitreous glass, glass gems, glass squiggles, mirror, tile, cast metal, brass, found objects, music memorabilia, paper collage, ephemeras, confetti, glitter. Music is so greatly important in my life- it has gotten me through some trying times and really solidifies my relationship with my husband because of our love of creating music together. At times we really have a musical â��mojoâ�� when playing; other times we canâ��t get it together, but boy do we laugh! Ever been stuck in traffic, feel your blood pressure rising? Crank on the tunes and sing- belt it out! Suddenly things donâ��t seem quite as bad as they did earlier! 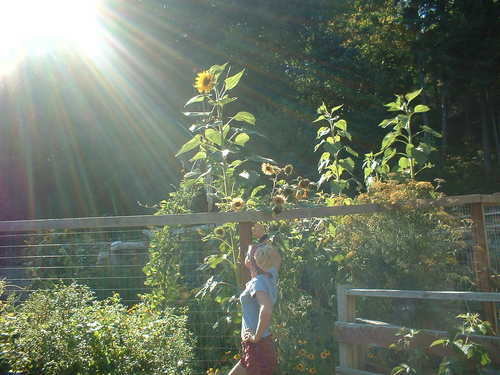 In spring of 2007 I attended a workshop at Royal Roads University called Arts and Health 101 and was so greatly inspired by Bisia Belina who teaches â��creative ways to access your breath, voice, body and sense of timing with her innovative, informative and revitalizing voice and movement workshops.â�� www.bisia.net Wonderful, uplifting and a whole lot of fun. 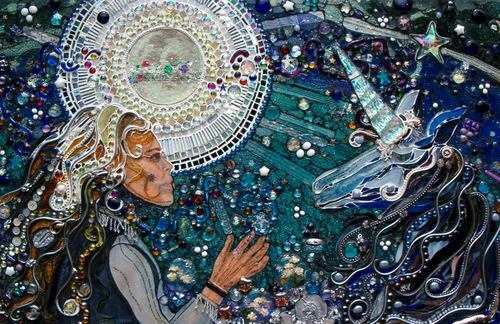 Stained glass, vitreous glass, glass gems and squiggles, mirror, shattered safety glass, jewels/old jewelry, copper, cast metal, peacock feathers, ephemeras, text, paint, glitter, and beading. The inspiration for this proud bird was sparked from observing our own peacocks that have resided on our farm for the last four years. These spectacularly plumaged birds are fascinating to watch, learning about their courtship and sexual dance performed for the female, and the different calls and their meanings (sorry neighbors!). As my family studied these birds it became clear we had to figure out a way to capture the luminescent brilliance of their feathers. If you change the view angle and lighting, they change colors, almost like a hologram. By adding the feathers under glass, it added so much depth, flow and realism to the overall piece. 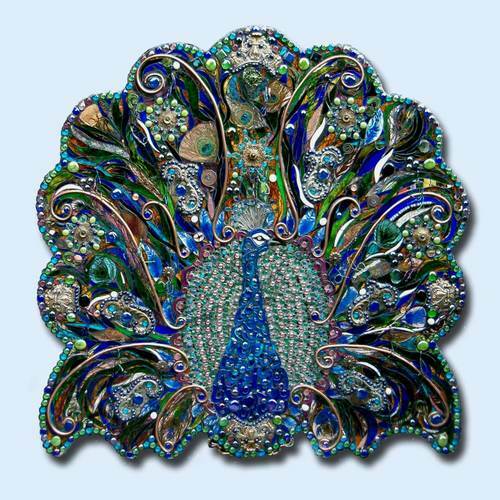 These birds are so pompous and adorned, so the more jewels sparkle and glitz the better! It is said that finding a peacock feather brings good luck, harmony, serenity, piece of mind, relaxation and protection. During the summer months when the males start dropping feathers, our farm becomes a treasure hunt for any children who come over for a visit. They are so delighted to bring home a prized feather! Antique automobilia, authentic collectors Corvette emblem, found objects, steel line, chrome, copper, windows, stain and vitreous glass, glass gems and squiggles, safety glass, material, leather, embroidery thread, collage, paint, ephemeras, text, glitter, confetti. 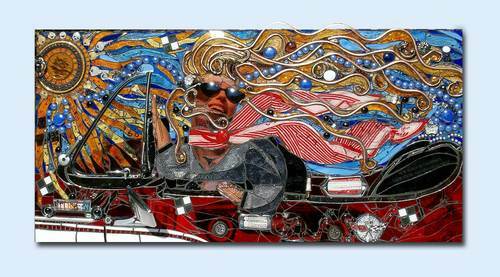 Inspiration: This piece started with a Corvette emblem, developed into a 1950 Corvette, driven by a woman cruising Route 66. Picture the sun shining, her hair flying in the wind, tunes cranked, the feeling of empowerment, perhaps taking a â��different road in lifeâ��! My art has many layers and depth, leading to hidden discoveries and inspirational messages when you stand back and look beyond the surface glass.